I did this walk on Friday 12th September 2008. I drove down from Walthamstow and parked just off the A20 on the edge of Folkestone from where I walked to Folkestone West station to catch the train to Ashford. On the way to Folkestone I had been diverted off the M20 between junctions 8 and 9 because Operation Stack was in place as the channel tunnel had been closed due to a fire in the tunnel that had occurred the previous day and I hadn't timed my arrival at Folkestone too well and had about 40 minutes to wait for the train. At Ashford station I had a further half hour wait for the connection to Wye from where I resumed my walk along the North Downs Way just before Midday, having left London at 8:30 in the morning! The through ticket had cost £6.60. I had passed through a few heavy showers on the way down to Wye, although as I started walking the sun was just beginning to break through the clouds. It was a very still day with almost no wind at all. I headed up Bridge Street, linking up with the route of the Stour Valley Walk. and then turned left into Church Street. 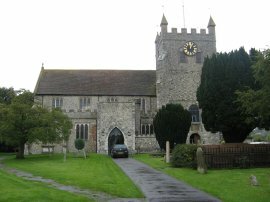 At the end of the road the route heads diagonally to the right through the churchyard of The Parish Church of St Gregory and St Martin, Wye, photo 1, and along a footpath that runs round past the buildings of Wye College. The route crosses a road and heads up Occupation Road to reach a broad track running alongside a field. The track then starts heading steadily uphill towards the top of the downs. 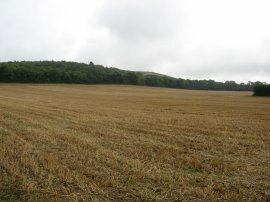 The route crosses a minor road, heads up besides another field, photo 2, before continuing slightly more steeply up through a patch of woodland. Leaving the woods the route turns right onto road, still heading uphill, then takes footpath on right to reach the top of the downs from where there were good views across the surrounding countryside, photo 3. 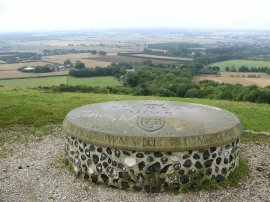 A little further on the route passes above the carved chalk Wye Crown which was cut into the chalk hillside to commemorate the coronation of Edward VII in 1902. It was quite hard to see the crown clearly from above although the site was also marked by the orientation table, photo 4, which had been built much more recently. From the crown there followed a pleasant stretch of level path along the top of the hills with the weather still steadily improving. 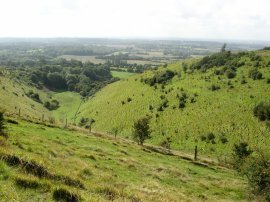 After about a mile of walking the route crosses a road and heads into the Wye National Nature Reserve which consists of 133 hectares of chalk grasslands and woodlands on steep coombes. 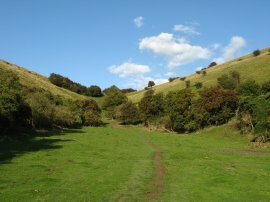 Here the path passes by the Devil's Kneading Trough, one of the series of narrow dry valleys cut into the North Downs, photo 5. 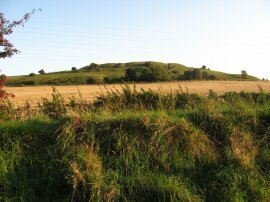 The path heads over the grassland and alongside fields, at one point skirting round the side of a kennels, Although some distance form the kennels themselves my passage was enough to set the dogs barking and I continued to hear them barking away for ages after I had gone past. Eventually the route heads diagonally across field of cattle, the young cows forming a long line almost like a flock of geese as they steadily, and quite noisily, grazed their way over the field. It was quite an impressive sight and I spent some time watching them slowly graze past. From the field the North Downs Way turns right onto the road, the left at junction signposted Southhill. 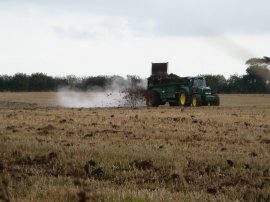 In the field to my right there was a muck spreader, photo 6, making the trip along the road rather smelly for a while, the contents of the trailer steaming in the still air as it was deposited on the field. At a bend in the road route continues ahead along a hedge lined farm track before turning right along another minor road where I stopped and had a short rest break, once again enjoying the good views over Kent from the top of the downs. Heading down the road the route passes close by the trig point on top of Brabourne Downs, photo 7, from where I caught my first glimpse of the English Channel in the distance and from where I could also see the Tolsford aerial mast ahead on the horizon. 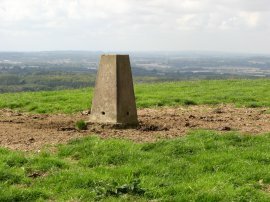 From the trig point the route starts heading downhill before takes a track off to the left. This runs over a grassy field, in which I spotted a bull, and on into another rather gloomy hedge line track. Crossing over minor road the path continues along another quite stony and bumpy hedge lined track which was quite rough on the feet that starts heading downhill to join a road. Here the path turns left along the road, soon taking a footpath that runs along the field edges besides the road, crossing numerous stiles in the process. 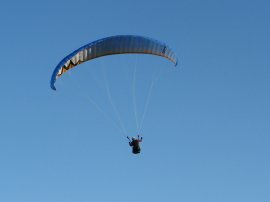 By one of these, on the edge of the village of Stowting, I spotted a pretty three legged cat. The route passes the Tiger Inn in Stowting and continues along the road before taking a short stretch of footpath on the left to cross over another minor road and then ascend up towards the top of Cobbs Hill. At the top of the hill the route follows the field edge round to the right to run along a path, photo 8, parallel with a road. 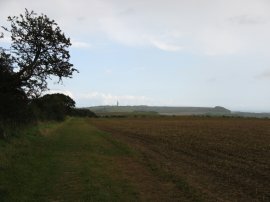 As I was walking along this stretch of path I could see a number of rain showers in the distance and as I neared Farthing Common it started spitting with rain. I sheltered by a hedge for a while but it was clear the rain was going to persist so I dug out my waterproof jacket and continued on my way. The marked path of the North Downs Way differed slightly from that shown on my map, crossing over the parking area at Farthing Common and continuing along a field edge before linking up with the route on the map and turning left to continue following close to the top of the downs towards the village of Postling, photo 9. Here I got caught in a rather prolonged and frustrating bout of rain. I could see blue sky ahead of me, and behind me, but the lack of wind meant that the rain cloud was just sitting on top of me for well over an hour which was very annoying considering I could see sunshine only a few miles away in both directions. 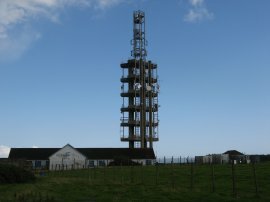 After spending quite some time sheltering under a tree the rain eventually died down and I made my way over a couple of grassy fields to cross a road by Staple Farm and started the ascent up a grassy pasture toward the radio mast on the top of Tolsford Hill, photo 10. 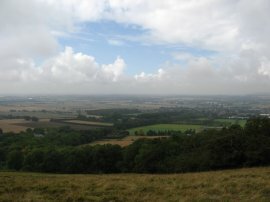 At the top of Tolsford Hill the North Downs Way links up with the route of the Saxon Shore Way which it follows all the way to Dover and, more briefly, the Elham Valley Way. Here the sun finally came through the last little bit of cloud and suddenly there was blue sky everywhere. With the still clear air I could see across Folkestone and over the English Channel to France which I could see clearly in the far distance. In the channel there were a number of large boats heading up and down and it seemed almost impossible that not half an hour earlier I was standing under a tree in a torrential downpour. 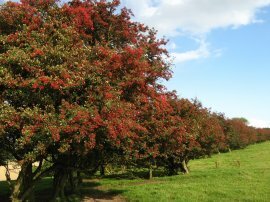 The path heads over a grassy area lined by Hawthorn Trees, photo 11, their berries shining brightly in the afternoon sunshine before heading through scrubby woodland of an army training base. The route turns left, heading downhill through trees, across a road and down the driveway to Coombe Farm before turning left to head over a field and under a disused railway bridge. From here the path heads through a small patch of woodland before turning to ascend very steeply up a coombe, photo 12, to rejoin the top of the downs. From the top of the coombe the path runs on fairly level ground through grassy fields before turning right along a narrow hedge lined footpath. This runs between fields and after quite some distance leads down to cross over another minor road where the route turns right to take a path that runs along the edge of a large open field. 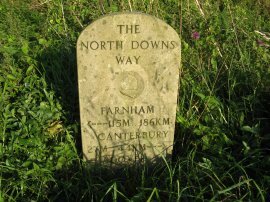 The route leaves the field for a while, taking a grassy path where there was another of the North Downs milestone, photo 13, this one now showing 115 miles from Farnham and only 9 miles now to Dover. 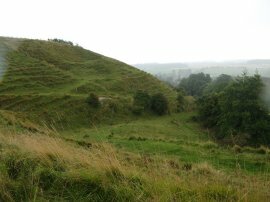 The route passes through an old chalk pit and rejoins the path round the side of the large open field. To my right at the foot of the downs below the field was the Channel Tunnel Rail Terminal, photo 14, and to my left over the field I could see a couple of paragliders, photo 15, who were appearing to hang almost motionless above the edge of the downs. When I had last walked here I had noted "The sound of the train engines providing a constant background hum" however with the terminal shut, all was quiet. 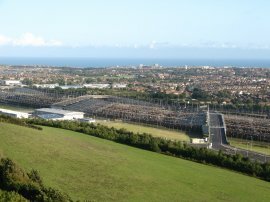 The route runs parallel to Crete Road West and parked alongside it I noticed a number of vans with satellite dishes on their roofs. 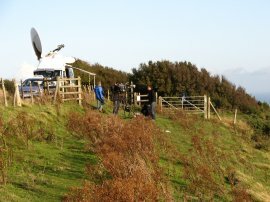 At first I though they might be filming the paragliders however it soon dawned on me that it was the assembled ranks of the press gathered to get good viewpoints for their stories about the closure of the Channel Tunnel and a little further on I came across a couple of camera crews filming from the path, photo 16. 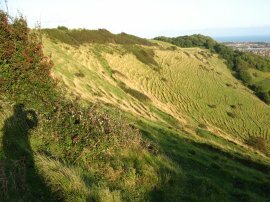 I continued along the path along the top of the downs above Folkestone, photo 17, as far as Castle Hill, photo 18, where I ended my walk along the North Downs Way for the day. Here I turned right and headed steeply downhill along Castle Hill, an old road that has now been closed to traffic. This runs through trees before coming out just above the entrance to the Channel Tunnel. I then headed across the A20 and continued down Cherry Garden Avenue back to the car. Reaching the car I had walked 15.7 miles of which 15.0 had been along the North Downs Way. This had been a strange days walking having been stuck in the rain for so long I had rather felt like Eeyore in Winnie the Pooh on an otherwise pleasant day. The day ended bright though and I had completely dried off by the time I reached the car.